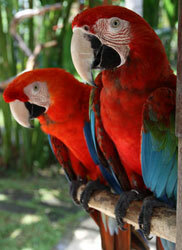 Parrots can be challenging to keep happy as companion animals and some species can live as long as 50 years or more. They are affectionate, intelligent, interactive and very entertaining. Many parrot species have the highly desirable ability to learn how to talk. 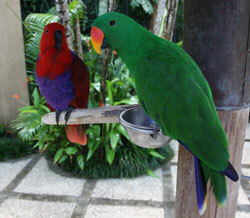 However most parrot species have complex behavioural and social needs which are difficult to meet in captivity. Parrots can be bought as “hand-reared” (hand fed by a breeder from a young age and hence, very tame) or “aviary-bred” (reared by it’s parents in an aviary, and not as tame). Hand-reared parrots usually make better companions and are therefore more expensive than their aviary-bred counterparts. Many of these problem behaviours occur because the parrot is deprived of, or is not receiving adequate social interaction or environmental enrichment. Parrots are highly social animals and easily become stressed and anxious without plenty of social interaction and mental stimulation. Boredom can also be a contributing factor to behavioural problems, especially for parrots housed in small cages with little to keep their clever minds occupied. Interactive toys, a varied diet and positioning the cage in the living room where all the action is can help minimise boredom. However, the best remedy for boredom is lots of time spent out of the cage interacting with the owner. Perfect parrot owners are people who are able to spend lots of time with their parrot. They are home much of the day and can supervise their parrot while it’s outside its cage. I do not recommend hand-reared companion parrots to people who work long hours and are not able to spend considerable amounts of time with their pet. If you do work long hours and want a parrot, buy a pair so they can keep each other company. Always buy the biggest cage you can afford and provide plenty of toys for them to play with. 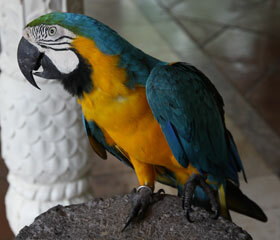 It is extremely important to do your research and to understand the needs of the parrot species you wish to buy. Parrot species differ considerably in both dietary requirements and behavioural traits. 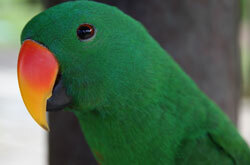 Some are primarily nectar eaters (Lorikeets), some require a predominantly seed-based diet supplemented with fresh fruit and veges (Cockatoos) while others need a diet consisting mainly of fresh fruits and vegetables supplemented with nuts, seeds and even meat (Eclectus). Some parrots talk, others do not. Some are more playful while others are more subdued. 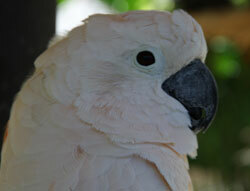 The following is a list of popular companion and aviary parrots. Remember to always do your research before buying a pet!